My strong preference is always for local places. I’m a big proponent of keeping money close to home, especially right now. 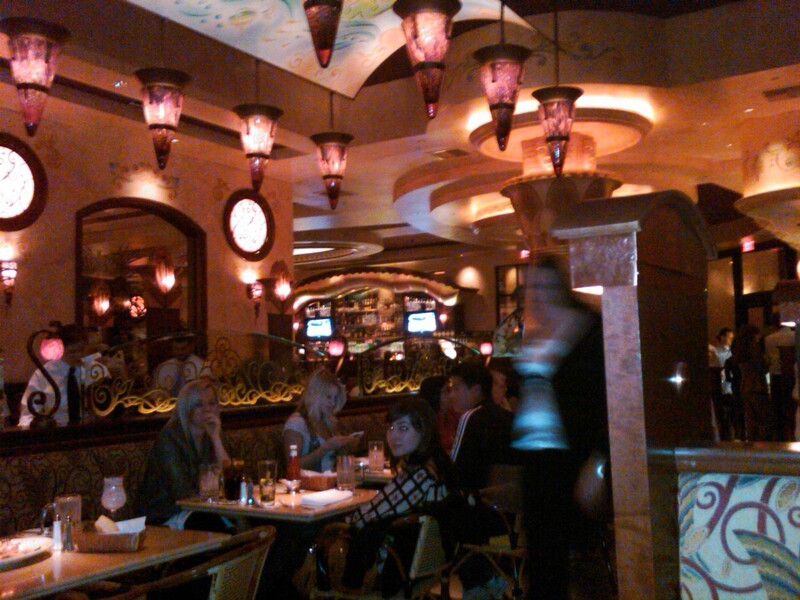 That being said, I got an invite for a sneak peek at The Cheesecake Factory last night, and jumped at it anyway. Before I go any further, I didn’t pay a penny for this meal. The whole thing was comped – which was a nice treat for Kristine & me. I guess this whole blogging thing has the occasional payoff! I went in with some preconceived chain restaurant notions. I was a little prejudiced against them in the beginning, but I’m happy to say that didn’t last long. The purpose of the evening was to help train their waitstaff. We were given special menus, asked to order an appetizer, two entrees, beverages (beer, wine & cocktails), and a dessert. At the end, we were presented with the ‘check’, but we just got to laugh at that. Our litmus test for appetizers is always calamari. Theirs (at $9.50) was served very quickly fried in a light, crispy batter. The calamari was cooked perfectly – not rubbery in the least. The cocktail sauce was pretty standard, but it also came with a sour cream-based garlic & tarragon dipping sauce that was very good as well. edamame. The ahi was cooked nicely – seared quickly and raw in the middle. 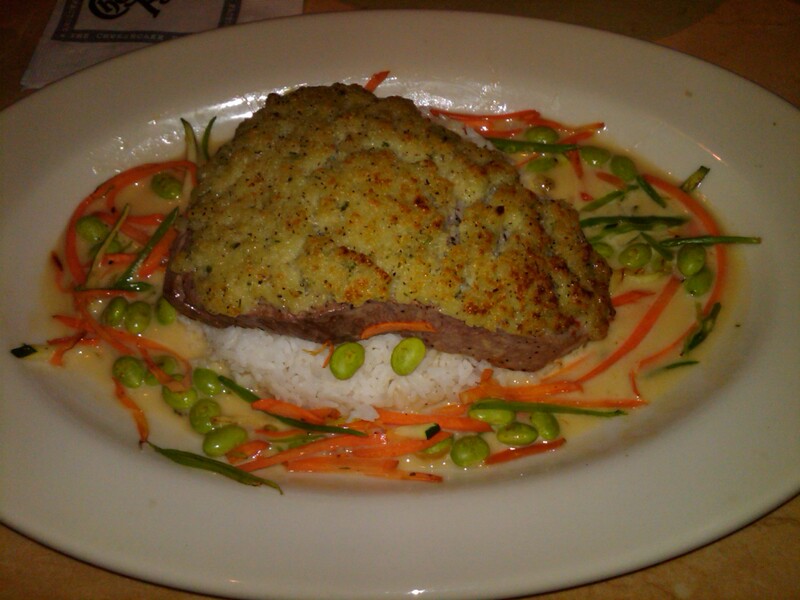 The rice was a great foundation and the beurre blanc was perfect. The one downside to my dish was the wasabi ‘crust’. It was more like a thick wasabi paste. The flavor was good, but the texture was not at all what I was imagining. Now, I’m a big eater, but this portion was ridiculously large. I took over half of it home. The piece of ahi must have been 12-14oz cooked. 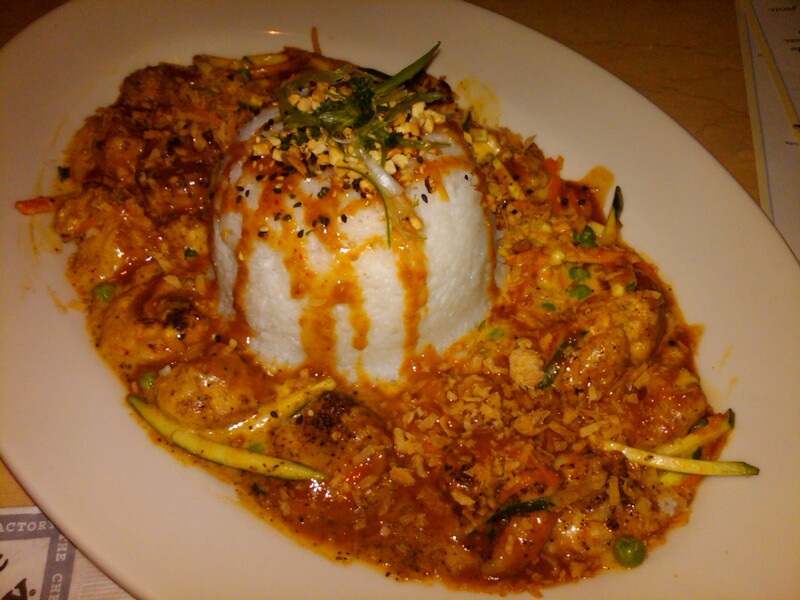 thai-inspired dish that included both chicken & shrimp. No real surprise there. The surprise (for me, at least) was that it was really good. I mean really good. Like I’d go back there for it. And I don’t like myself all that much for even admitting that. The sauce was chile/peanut/coconut and it was sweet, spicy, and savory at the same time. Nice. Dessert was a brownie sundae cheesecake (pictured above). We had initially wanted the Kahlua & chocolate, but they were out of it. Nonetheless, dessert was good. That much I was expecting, so wasn’t as taken with it. Go figure. We only managed to put away about half of it before boxing it up with all of the remaining food. So our grand total (which included one glass of wine and one specialty margarita) would have come to ~$84.00, which made me happy that we weren’t paying for it. What I didn’t expect is that I would have been OK paying that, and will even go back and pay that much at some point. Service was great – very attentive without being all up-in-your-grill. The decor is pretty over-the-top, with kind of a theme-park feel, but I was OK with it. Honestly, I didn’t expect to like The Cheesecake Factory as much as I did, but I admit it: I liked The Cheesecake Factory. 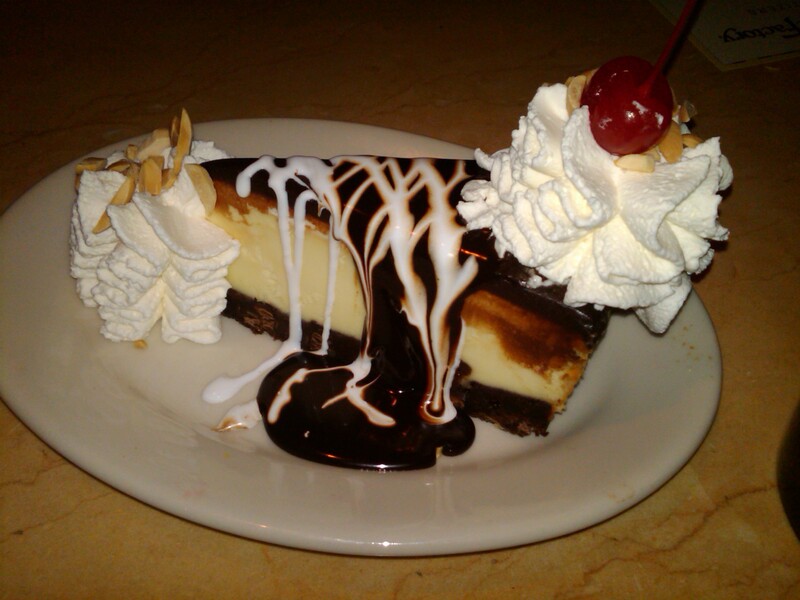 The Cheesecake Factory is located on the south side of the Tucson Mall at 60 Wetmore Rd. They can be reached at 520-408-0033, or visit them online at thecheesecakefactory.com. Oh, and they literally have a 35 page menu, so be prepared to be overwhelmed. Enter your email address to subscribe - get notifications of new posts by email.